There's an episode of House M.D. in which the brilliant but cynical doctor is asked by his boss if he knows what a simchat bat ceremony is. He replies that he does; "It's an ancient Jewish tradition dating all the way back to the 1960s,” he explains. I feel much the same about Lag B'Omer. Growing up in England, Lag B'Omer was barely noticed; it was merely a day in which the frum schools went for a hike in the cold and wet British countryside. Today, in Israel, the Lag B'Omer bonfire seems to be more important than the avodas Yom Kippur of the Kohen Gadol in the Beis HaMikdash. Shopping carts are stolen by kids who cart away any piece of wood that they can find. The second little piggy would lose his house even before the Big Bad Wolf showed up. 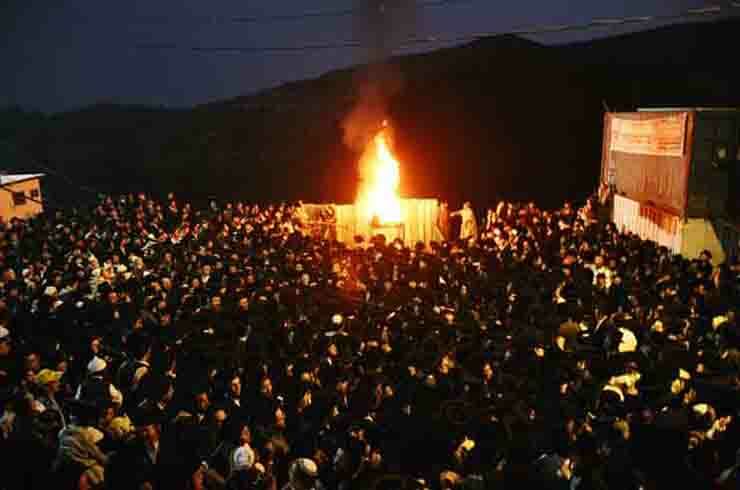 But perhaps the most interesting and disturbing aspect of the Lag B'Omer bonfire phenomenon is how it sharply demonstrates the difference between the national-religious (dati-leumi) and charedi approach to Judaism. A few months ago, in a post entitled Rosenblum Nails The Problem With Charedi Society, I noted that one of the most striking and significant differences between the charedi and dati-leumi communities is with regard to their "Klal Yisrael consciousness." The dati-leumi world perceives itself as part of the entire nation of Israel and weighs its approach to Torah in that light. The charedi world, on the other hand, sees itself as a separate entity, and therefore doesn't care as much about the welfare of non-charedim, whether spiritual or physical. When Lag B'Omer falls on motzai Shabbos, as it did last year and as it does again this year, it provides a powerful demonstration of this. Having bonfires on motzai Shabbos would mean that there is a risk of people who are lax in their Shabbos observance making various preparations on Shabbos, as well as the emergency services having to get in place on Shabbos. As a result, it was proposed by various dati-leumi rabbanim that the bonfires should be delayed until Sunday night. As they pointed out, Chazal made a much more drastic move to safeguard Shabbos when they suspended the Torah commandment of blowing the Shofar on Rosh HaShanah due to the mere risk that someone would carry a shofar to an expert who will teach him how to blow it! Certainly a bonfire, which is not a mitzvah at all, should be delayed when it certainly causes chillul Shabbos. This logical proposal was accepted by the Chief Rabbinate of Israel. But this move is entirely ignored by the charedi community. Their primary reason appears to be that nobody in their community would be mechalel Shabbos, so why should they change their plans just because of people in the emergency services who aren't charedi? Perhaps an additional reason for chareidi rejection of the move is that they are not going to make a change based on a directive that comes from such a source. The move was first proposed by Rav David Stav, head of Tzohar and a candidate for Chief Rabbi in the last elections, who was sharply condemned by charedim for being "too lax" in his approach to Judaism. Likewise, the move is being strongly pushed by Rav Yaakov Ariel, who was defeated in a previous election for Chief Rabbi because Rav Elyashiv's camp felt he was too moderate; they wanted Rabbi Metzger, whom they said would "restore the glory to the chief rabbinate" by following Rav Elyashiv's dictates. Another rav pushing for the bonfire move was Rav Druckman, who was attacked by Rav Elyashiv's court, allegedly for allegedly being too lax regarding conversion. At any rate, there is an extraordinary irony here. It is precisely the rabbanim who are condemned by the extreme right as being "too lax" who are the ones actually trying to prevent widespread chillul Shabbos that is caused by those on the right. These dati-leumi rabbanim turn out to be the ones who care the most about shemiras Shabbos for all the Jewish People. The modern incarnation of Lag B'Omer turns out to have a surprising benefit, after all. It's an opportunity to learn about the nature of different communities and different types of rabbinic leadership. This logical proposal was accepted by the Chief Rabbinate of Israel. But this move is entirely ignored by the charedi community. Is not today's Chief Rabbinate a part of charedi community? They may be personally Charedim, but not in terms of their position as Chief Rabbi. And they still ignore it. Not sure how you define "part of the charedi community" - but having regularly attended shiurim from Rabbi Lau for the past 10 years, I can't think of a single time I heard him make a statement that sounded "Charedi" - his approach to Zionism, education, army, seems much closer to the Dati Leumi position than the Charedi position. I wish we could just ban Lag Ba'omer altogether. Bal tashchis, bittul zman, and a host of other problems. It's the last thing Rabbi Shimon bar Yochai - the one who said the ideal is to work constantly without working - would have wanted to be done for his honor. "Their primary reason appears to be that nobody in their community would be mechalel Shabbos, so why should they change their plans just because of people in the emergency services who aren't charedi? " How do you know this to be the case? Rav Ovadia encouraged the postponement even when he wasn't Chief Rabbi. Which sort of ruins the taxonomy here: how do you deal with Sephardic Haredim? Sefaradim are an entirely different animal. The best way to describe the difference between haredi sefaradim and Ashkenazi haredim is that sefaradim on the right tend to be more right wing in terms of philosophy and outlook, but are quite rational when it comes to halakhah. Sefardi charedim nearly all still have first degree relatives who are not charedi - or even not religious at all. That is no longer the case with the Ashkenazi charedim in Israel. ROY was always conscious of this fact. The charedim only want a charedi chief rabbi in order to have him fix policy in a way that is advantageous to their needs. They never actually listen to the rabbinate as a Torah authority. Only as the seat of power. A ridiculous post. The reason the shofar isn't blown on Shabbos is because the tikkun of blowing a shofar is not needed or is accomplished in a different way according to Chabad. Any בר בי רב understands that עלית נשמה happens on מוצאי שבת. You can't light the bonfire latter because the נשמה won't have the right Tikkun. Every year that Zaddik's נשמה goes higher he is able to help us I ore. I don't know what you learned over there in England, but this is what my son learned in cheider in BP. I'm going to check out what my grandson is learning this year, but I don't think it's anything different. Please learn a little torah before you call other people ridiculous. Ypu can start with that minor work in the history of the Jewish people known as the Talmud Bavli or the Gemara. Despite the obscurity of the work, Artscroll has nevertheless produced an English translation. Review Rosh Hashana 29b. A minor sage known as Rabba (only mentiond approximately 10^3 times in said minor work) has an interesting idea which you seem to think is ridiculous. None of this makes any sense to me as I'm Jewish. Really, Carol? Did you really think you weren't going to get destroyed on that one? Rav Shach ztz"l allegedly said once that Chabad is the closest religion to Judaism - after reading your post, Carol, I'm not sure that's true anymore. Carol has been commenting on this blog for a few years--I'm close to sure she's not serious (unless it's a different Carol). On a more serious note: didn't they at least agree to light the bonfire in Meron later, like 11:30 PM? Thanks for the smile - Greg House's best line ever! For a group that holds the Chasam Sofer's interpretation of "chadash assur min haTorah" as its mantra, it is amazing how many new things that they have introduced or adopted that the Chasam Sofer himself would never have recognized. and how ironic that it was specifically the lag baomer celebrations in meron which prompted the Chasam Sofer to question moving to E"Y.
Charedim threatened Elal with a boycott if they were to fly on Shabbos, but don't care if the police desecrate Shabbos. Go figure. column 2 line 18 ff. But I'm not current in the topic so if you think there's a difference i might not be able to defend that letter. While much of what you say is correct, I think you are missing a key issue, which significantly mitigtes your charges of chareidi indifference to non-chareidi chillul shabbos. Most charedim, certainly chasidim see lag baomer and its practices as having deep kabbalistic metaphysical significance. IT make no more sense to them to move lag baomer observance to avoid chilliul shabbos than it does to move leil haseder. Most DL dont take LG BO so seriouly and certainly not the bonfires, so for us its a no brainer to move the date. I'm pretty sure that they believe shofar to have deep kabbalistic metaphysical significance also. And yet Chazal cancelled it on Shabbos. So I take it chassidim fast on Tish'a B'av when it falls on Shabbos? 1) The very phrase "Lag Ba'omer observance" is telling. To "observe" something is to keep it, guard it, like "Shabbat observance". Is lighting a bonfire on Lag Ba'omer now something on the order of a "mitzvah" such that it has to be "observed", guarded? 2) If people object to lighting a bonfire toward the end of Lag Ba'Omer on spiritual-mystical grounds, that seems to imply that there's something about "leil" Lag Ba'omer (like "leil haseder") that has special spiritual significance. But is there anything in classical kabbalistic literature that distinguishes the "night" of Lag Ba'omer as having some sort of "spiritual power"? I tend to doubt it! To me, this is a great example of how a minhag can get turned into a quasi-mitzvah, and how "spiritual realities" can be created/invented more or less out of thin air. Natan, lucky for us Chazal predated kabbalisms invasion of rational judaism. The minchus eluzur criticized the lag baomer meron business, but made sure to go there on his visit to israel (palestine) in early 1930s. There are no positions of sfardi charedim. They are completely identical to ashkenaz charedim. Even rav ovadia (whose motto of "leHachzir ateret leYoshna") in his later years almost completely agreed with ashkrnazi charedim. Chadash assur min haTorah, but the chatam sofer would be MO today. By the way, since I have never been in the US for Lag B'Omer, can someone tell me if the yeshivish community there does bonfires? I grew up in Flatbush and never saw one there. I think that the Rebbes do it in the more Chassidic neighborhoods. I can't imagine FDNY would allow big ones like some of the huge bonfires I see in Jerusalem. The Philadelphia Yeshiva never had a bonfire in my day. (I can't comment on what might happen there today.) I've heard it happens in the chassidish communities but I don't think it happens in the litvish yeshivot. That said, OJ Jews across the spectrum light bonfires and BBQ in the US in celebration of Lag B'omer, but without any kind of ceremonial purpose. It's just something that's done because it's "The Thing To Do," sort of like eating Felafel on Yom Ha'atzmaut or watching a Chofetz Chaim Heritage Foundation video on Tisha B'av. Don't know what part of Flatbush did you grow, but every year entire East 29th Street between J and K are closed and guarded by police for a huge bonfire. Anyone in Brooklyn this week can see for himself. Flatbush has been having one for a few years on Avenue L and Coney Island. The traffic is blocked and the meshugas goes on till eleven, IIRC. @koillel nick, Lazar, what years are you talking about? Why assume you are refering to the same ones? Living very close to Meron, I'm very aware of the huge preparations that go on before Lag B'Omer. And when I hear about the idea of pushing off the festivities to the next day this is what I think these Rabbis largely have in mind. With the huge crowds which are arriving, the police and Magen David need to be in place hours beforehand, All those who argue that they personally are not mechallel shabbat, and therefore this directive does not apply to them, are not thinking of the huge number of personnel who have to arrive in Meron on shabbat in order to supervise the occasion. I have to disagree here. The dati leumi community was rather silent about the Tel Aviv city council decision to adjust the city bylaws permitting commerce in certain areas on shabbos. They did not join in the legitimate battle against el al. I suspect that what's at work on both sides is an unwillingness to join forces even on issues in common. That's what's so sad. Not the same. You cannot bring about Shmiras Shabbos by forcing the Chilonim to keep Shabbos or not do commerce on Shabbos. Policing Shmiras Shabbos usually only backfires. It is a different matter altogether when your gathering itself causes Chillul Shabbos. This Chillul Shabbos would be avoided by just postponing the event until the next day. Excuse? What "backfiring" they weren't keeping Shabbat to begin with and by boycotting a legitimate business it does bring decisions of them to change their course of action. It is 100% legitimate and very positive. The Torah says to have Judges and POLICE that will enforce the decisions of the judges. Now granted a boycott is not a police force, but its at least a step in the right direction. And in fact people are arriving in drove before Lag b" Omer and require policing and medical services during the Shabbat preceding the event. On the specifics here (moving the bonfires to Motzei Shabbos), I'm not informed enough to comment. But it is 100% true that Charedim will, as a rule, reject almost anything that emanates from outside its community, and create an ex post facto rationale. This is THE reason, and no other, why Charedim reject everything, from the state of Israel, to Steinsaltz, to Soncino, to wearing techeles, to much more. Now, often things they reject eventually make it into the community, via a kosher charedi source, in the same manner that translations, once reviled as a "crutch", became kosher when Artscroll got into the business. If I were a betting man, I would bet even money that techeles will eventually be accepted. There's too much money to be made, and somebody will eventually realize he can make a fortune on it. You can even justify a 50% markup by coming up with some sort of unnecessary chumrah over the Ptil version to justify a higher price, like the new black tefillin straps, or Deri lulavim. (Techeles is already expensive, but to my knowledge most of the cost charged by Ptil is for basic operating expenses, not "not for profit" profit margin.) All this clever businessman has to do is find some genuine, well-known charedi figure who he can pay to give his hamlatza, and that little crack eventually will become a flood. You can take it to the bank, it is going to happen. DF obviously meant "moving the bonfires to Sunday night" in his first sentence. Get your threads today before they officially become "Kosher". LOL. I make no attempt to pigeonhole commenters on JBlogs, so I don't know if Carol is being facetious or not. Assuming that she is serious, she illustrates the divide between those whose religion can be considered rational and those who are enthralled by mystical, non-rational ideas of uncertain origin. The talmud specifically cites Hillul Shabbat as the reason why they legislated against blowing Shofar on a Rosh Hashanna day that falls on Shabbat. Only over a millenium later did the mystical notion of Tikkun become adduced as a rationale for not blowing on Shabbat. Even if you accept the latter premise, it can not remove the official Talmudic basis. Note, that the Talmudic concern was for the potential violation of Shabbat by the ignorant. In other words, by those outside the rabbinic sphere of influence. A definite Talmudic teaching certainly overrides some teaching of so-called contemporary Gedolim, much less, Cheder rebbe'im. This notion of Tikkun which is, of course, non-demonstrable is being carried to levels which make its believers followers of a near-different religion. Some wag, once opined that Chabad Hasidus was the religion closest to Judaism. I fear that Hareidism, in general, is intent on reaching that exalted status. The custom of bonfires on Lag Ba'Omer appears to be an extension of the original adopted practice featuring the hair-shearing of little boys and a bonfire celebration at the reputed cave of R' Shimon bar Yochai on Lag Ba'Omer. The latter practice, it is said, was originated by Jews from Arab lands in imitation of an old Arabic custom at the grave of some Muslim saint. Now this relatively recent custom is seen as overriding concerns about Shabbat violations. It's just another example of the increasing absurdity of the beliefs and practices that have gained currency among Hareidim. IIRC the Lubavitcher rebbe reasoned that there cannot be any obstacle to a איד performing a mitzvah. Therefore the true reason for not blowing the shofar on Shabbos is because it's no longer necessary for the tikkun. I heard that prof. Branover, who is a physicist, has an explanation how it is scientifically possible for the Rebbe to be dead and alive at the same time. You don't find this rational? Indeed - the Lubavitcher Rebbe must have really been a Heisenberger chasid! The question may be valid (the Mishna Berura also uses that question in one place), but you can't reject what the Gemara says based on that. The question is not originally from the (last) Lubavitcher Rebbe, but from the Ba'al HaTanya (Likkutei Torah, Devarim, 56a and onward). There are a number of series of discourses (המשכים, in our jargon) that discuss the question: for example, from the years תרנ"ט, תרס"ה, תרס"ו, תש"ג. In none of them is any attempt made to "reject" a Gemara, but rather to explain why Torah mitzvos, like shofar, or lulav, are pushed off on Shabbos based on a concern of chillul Shabbos, where we see that other mitzvos, like milah, weren't. As the Rebbe makes clear, in the sichah ענינה של תורת החסידות, (translated, On the Essence of Chassidus), a chassidic explanation is a "holistic" explanation, not rejecting any of the other levels of פשט, רמז, דרוש, סוד, but only elucidating them. My thanks to Gavriel M. for his concise summary of the discussion, and the link to the Yerushalmi. Yerushalmi has not heard of תקנת רבי יוחנן בו זכאי? It's not a historical event? Bavli was מחדש it? Carol, just take 10 minutes to read what it says. I have provided a link (Perek 4 Mishnah 1). I don't see what this has to do with the takana of Raban Yochanan Ben Zakai, which, of course, the Yerushalmi also accepts, since it is stated in the Mishnah in question. A little spoiler: The website Carol quoted below states "We must conclude that the Sages understood that on Shabbat it is actually unnecessary to blow the shofar". This is correct except the words "outside the temple" need to be added and a few other words need to be removed. Learning this Yerushalmi, quite literally, changed my life. Personally, I think the Yerushalmi's explanation is highly reasonable and obviates the need for complicated kabbalastic or pilpulistic explanations. You are right, I hadn't read it. I apologize, my bad. Was working long hours and not thinking. It's an interesting explanation but how is it life changing? When it comes to money, values go out the window on both sides. The dati-leumi newspaper in Israel, B'Sheva, accepts ads from entertainment venues that are open on Shabbos, while no Haredi publication will knowingly do so. I once emailed B'Sheva about this, and received no reply. Both Haredi and DL publications also accept ads for expensive vacations at resorts abroad, despite the serious halachic issues involved in leaving EY just for a vacation. I assume all involved have asked their "shailas" about this, but still, neither side is lilly-white on the Shabbos or "money uber alles" issue. SA -- charedim have no issue with travelling to ch"ul for pleasure. That's strictly a DL issue. Do charedi editions of mikraot gee dolor not have that rashi in Behar which quotes Chazal in torat kohanim on those who leave the land of Israel ? Actually, Hamodia runs notices a couple of times a year to the effect that "Publication of ads for vacations in chutz la'aretz implies nothing about whether it is permitted to travel to chutz laaretz, which each person must check with his Rav." Of course they know it's an issue. It's one of those things they've chosen to fudge. If you want to be rationalist then be rational. Some (minor) rebbes in flatbush advertise their bonfires well in advance. Ditto BP. As for fire dept, plenty of politicians to arrange official / unofficial permission. (On the subject of rebbes (and RY) advertising, thats a very lucrative business. Review your copies of "heimishe" newspapers / magazines / radio programs. Another thing is that the Chareidi Gedolim are more the ivori tower type and older, so it's harder to infer anything from their silence. Who is the main force behind the Kiruv movement? I mean, accusing the Chareidim of not caring about Halacha observance among the secular... . I think when it comes to Chareidim there's allot of glibness here. Note the chillul shabbat of shofar / megillah / lulav is for practice / nonmitzvah use. A small correction of no significant consequence: According to a transcript of the show House MD, the line is: "It's a Jewish baby-naming ceremony, a time-honored tradition dating all the way back to the 1960s." I don't know if this was one of the considerations, but for those whose aveilus spans the second half of sefirah, they are not allowed to listen to music or cut hair after Lag B'Omer. Thus, delaying the celebrations would be equivalent to cancelling them for those people. Not if it is halachicly treated as a nidcheh - like Yom Ha'atzmaut is often, like it was this year. To be clear, I attach no great religious significance to the bonfire celebration of Lag B'Omer and if I were the policy maker, I would just cancel it this year due to chilul Shabbos concerns on Sunday and aveilus concerns on Monday. I don't think that would fly in the chassidishe world, though. Student: what about nachem on tisha bav which is a nidcheh? I agree with your main point. As an aside, I think it perhaps not proper for you (as a rabbi) to quote Dr. House. I used to watch that show but, because of all the off-color jokes and references, at a certain point I stopped as I simply could not justify to myself, as a frum Jew, listening to (and, eventually, laughing at) the crude comments Dr. House constantly makes. It's funny how Lag B'omer, which did not have any special observance until the Ari, is the point of this dispute between types of people that have existed much less than that. Meanwhile, the minor issues such as not being a drain on society, which could be linked to commandments in the Torah, get no mention by Chareidim. I'd like to posit that the entire idea of "Orthodoxy" in the Chareidi sense is a fairly recent development and is actually a divergence from the essence of Judaism. Here's what Rav Amnon Bazak had to say on Facebook. Very strong. Note how he stresses that these are the Chief Rabbis Haredim wanted. Of course, every time I see arguments like this, I wonder if the real point the author is trying to make is the actual truth: That charedim just don't care. This is the actual answer to every single question that begins with, "Why don't Charedim do X if halakha says X?" and the like? אם לא יתעשתו רבני הציבור החרדי ברגע האחרון ויכריזו על דחיית אירועי ל"ג בעומר במירון ממוצ"ש ליום ראשון בערב (כפסק הרבנים הראשיים שבהם תמכו), הם יאבדו את כל הזכות המוסרית להיאבק את מאבקי השבת מכאן ולהבא. סירובם של החרדים להיענות לבקשה, פירושה החד-משמעי הוא זלזול מוחלט בחילול השבת ההמוני שאלפי שוטרים ייאלצו לעשות. וכל זה, כידוע, לא בשביל לקיים מצווה עשה דאורייתא, תקנת חכמים או הלכה בשלחן-ערוך, אלא בשביל מנהג. יפה ונעים ככל שיהיה (אם כי גם שנוי במחלוקת), האם שימור מנהג כלשהו מצדיק חילול שבת שכזה? וכיצד מי שמתעלם מחילול שבת בסדר גדול זה יכול אחר כך להתלונן על פתיחת בית עסק זה או אחר בשבת בכל מקום אחר? איפה הפרופורציה? כמה עצוב, שדווקא בל"ג בעומר, שבו על פי מסורת הפסיקה המגפה בין תלמידיו של ר' עקיבא שמתו בגלל שלא נהגו כבוד זה בזה, יש המבקשים להעדיף אינטרסים לא ברורים של ציבור אחד על פני האינטרס הלאומי הברור, ועל פני כבודם של רבים משוטרי ישראל שייאלצו לחלל שבת כדי לשמור עליהם. מה טוב היה אם במקום לפגוע בכבודם של שוטרים אלו בקבר רשב"י, היו משננים לרבים את העיקרון החשוב שרשב"י קבע: "כל ישראל בני מלכים הם" – כולל השוטרים, כמובן. Nachum, you must be wondering rhetorically, because you are wise enough to know that of course that is the answer: Yes, they simply don't care. Halachic arguments are meaningless. They are marshaled by the religious when they support their custom, and used pretty much as a "guilt" argument with which to attack their opponents. But when it goes against their lifestyle, halacha is just distinguished or outright ignored. In numerous chassidic discourses10 it is explained that it is inconceivable that the Sages would deprive all of Israel of the benefits afforded by one of the greatest mitzvot we have—simply on account of a few ignorant souls who might otherwise err. We must conclude that the Sages understood that on Shabbat it is actually unnecessary to blow the shofar, for that which we normally accomplish through sounding the shofar is, of its own accord, accomplished on Shabbat. then why was shofar blown on shabbat in the beit hamikdash and later in Yavneh? I think a better question is: why have the Mitzvah at all, if we have Shabbos every week? The answer, of course, is that all this stuff Carol is quoting is complete Mishugas that CHaZaL would have been embarrassed to have associated with Judaism. Adam: You can get a haircut on Friday, whether you hold of the Rabbanut or not. another newly resurrected 'holiday'. cheshvan 11. yom petirat rachel imenu. worsthing that struck me last year was the incomprehensible neglect of children, allowed to forage for wood, build and tend fires on their own. hashem yishmor. I think it's sometimes too easy to give grand explanations. Maybe the Chareidi world has even more "Klal Yisrael" consciousness in their concern that moving around holidays willy-nilly causes disregard for those holidays. Maybe they disagree that Lag BaOmer will in practice cause chillul Shabbat, since most of the people who would be mechalel Shabbat wouldn't be involved in Lag BaOmer in any case, or they would be being mechalel Shabbat inside their homes in any case. I don't think the true impact of Klal Yisrael Consciousness is anywhere near as clear as you imply, and I'm not sure that making decisions so lightly (including moving Yom HaAtzmaut because of Yom HaZikaron memorials) is necessarily good for Klal Yisrael. Bruce - my son is in basic training and he had "rasa"r week" the week of Yom HaZikaron. He and a few other soldiers were sent off early Sunday morning to start getting the brigade's memorial location ready for the evening and following day ceremonies. I have no doubt that this would have involved tremendous chilul shabbat had the day not been moved. While the actual day of 5 Iyar has significance, we should all keep in mind that we cmfortably say full hallel and have kriat hatorah for 8 full days of chankah commencing on a date that while laden with significance was a relatively arbitrary date in terms of the events chanukh commorate. No battle was ended that day. It was not the day the temple was re-captured. It was chosen by the military leadership of the time as the day to re-dedicate the temple as it was the day of a then ongoing annual celebration of the date of the dedication of the second temple. There was clearly a conscious decision to "play with the dates" and Klal Yisrael did OK for a 150+ years after that. and still keeps to those dates. So if the best thing for Am Yisrael and Shabbat is to establish Yom Haatzmaut permanently on the Thursday following 5 Iyar and Yom Hazikaron the day before, I don't think there should be much religious grounds to question this. Obviosly Roshei Yeshiva have to keep themselves gainfully employed and will write up lots of maamarim on this - but when you step back and look at the big picture - there is really no issue with this when taking into account how long the 1948-49 war lasted and how long it took to achieve recognition of the State. Only the religious are celebrating Lag B' Omer!? The way I see it, everyone under the age of about 15 is involved in making bonfires on Lag B;Omer. It's THE holiday of children and teenagers. And moving the bonfire-making to the next night prevents chillul Shabbat: I've witnessed teenagers starting their bonfires before the night of Lag B'Omer. Here we see that Haredim have the real Klal Yisrael conciousness while the DL have a confused one. FINALLY, the voice of wisdom!!! Bonfires are not mentioned in the Torah, the Tanach, nor the Talmud before 200 years ago. The word bonfire comes from the word bone-fire, a pagan ritual that dates back thousands of years. Yirmiyahu (Jeremiah) 10:2 warns Israel not to follow the ways of the goyeem (in some translations pagan nations). Lag B'Omer is an abomination. It is Molech all over again and Israeli Jews (both religious and secular) are sacrificing their children to this god and his fires. No explanation rational or irrational can justify Bnai Israel doing avoda zara. If it looks like a duck, quacks like a duck, acts like a duck, it's a duck. Lag B'Omer is a Avoda Zara. Haval, after 6000 years since Adam, after 3500+/- years of Moshe Rabbainu giving us the Creator's Torah at Har Sinai, we the "Chosen" people still follow the ways of the goyeem. If my children behaved like this towards me, I would disown them. I am amazed that God has tolerated this from us all this time. And as to Ashkenazi, Sephardim, Haredim, Dat-Leumi, mamash haval. If we the Jews, can't be united, then when are we going to be a "light unto the other nations"?